If you need Invisalign braces in Vancouver, WA, Dr. Bowyer is happy to provide this service for you. Invisalign braces are an increasingly popular option for patients who need braces, but don’t like the idea of bulky, high-maintenance metal braces. Invisalign uses a series of clear retainers with minor tooth movements built into them to gradually straighten and align your teeth. You wear each aligner for two weeks, and see Dr. Bowyer every six weeks for regular checkups. 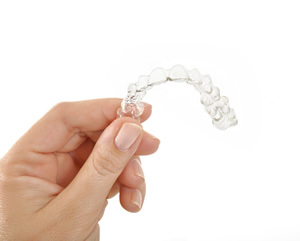 Many patients prefer Invisalign braces because the clear aligners are nearly invisible, unlike conspicuous metal braces. The aligners are also comfortable, removable for easy cleaning, and allow you to eat whatever you want (unlike metal braces, which keep you from eating foods that might get stuck in the wires). Overall, Invisalign braces are more pleasing aesthetically and have lower maintenance requirements, while being just as effective at correcting dental problems – a win-win for patients. If you would like to get a free consultation to see if Invisalign is right for you, contact Dr. Bowyer at his Vancouver clinic. Call our office at (360) 253-2640 or use the form to schedule your appointment.